There are more ways to redecorate your home than simply using paint and wallpaper. By thinking a little more imaginatively you can create a beautiful home in no time. Here’s our top 25 tips to decorating your home on a budget! Focus on completing one room at a time. As well as setting a budget, set yourself a time frame for each room. A simple one colour lick of paint with a feature wall will make a real statement to a room and give it a complete makeover. Clear clutter and get organised. Be ruthless when it comes to getting rid of things you no longer use or want. Be honest with yourself, it is the first step to getting a beautifully decorated home. Get a friend or family member to do an appraisal for you. When you have been living in your home for a while you see the same thing and getting a fresh set of eyes gives a different perspective when it comes to what decoration to go with. Move your existing furniture around and taking a couple of items out and replacing with new or refurbished ones, will completely transform a room. Reuse old furniture and give it a second life – take an old chair and make it into a bedside table. Create space where there is none! Using mirrors and glass accessories gives an airy and open feel, creating space through a small room. Avoid big retailers and go to garage/house sales, look on eBay, Gumtree or other auction or selling sites for decorating items people have not used. Look in second hand shops and markets for items you can reuse that will add interest to your home – be bold! Make your own art and get creative. Choosing white linen with florals keeps your bedroom looking spring-like all year round. Painting a room plain then hitting it with vibrant colours like green and generously accessorising in that colour will make the room pop. Building a desk, shelves or wardrobe doors is a way to get your clutter out of sight. Transform dark rooms with lighting. New lampshades or spray painting an old lamp stand works wonders. Keep the theme simple so as to avoid needing to buy lots of different colours. Create a gallery feature on a plain wall using different frames for interest. If you aren’t sure how to place them, going for something geometric will always work well. If you go for plain walls, to keep paint costs down spruce up with different textures, throws and pillows in different colours. Create a focal point in each room and then group things around that. Don’t just buy things to fill space, go with items you really love. Less is more! Don’t just buy something because the price is right, make sure you like it. Add something new to your kitchen to spruce it up like new cushions on the chairs. Being on a budget doesn’t mean it has to look cheap. Mix and match things you have bought; higher end with lower end. Market and second hand store bargains add a vintage feel. Vacuum and washing the floors will make your home sparkle. Make sure you get rid of all the dust from what you do have. Let the sun shine in, open your doors and windows to let in the air and clean all the windows. If you are not a good saver then this article is just for you! If you are, then great, you might pick up some new tips and become even better at it. Saving leads to a healthy financial life and avoids you having to go into debt. Often times when unplanned expenses come up, like the washing machine or fridge breaking down we have to borrow to cover it. These aren’t items we can do without and so if the only way to buy a replacement is to borrow, what choice do we have? There is a whole list of ‘emergencies’ where we may need to buy something immediately. If we had savings we would have peace of mind that we have a cushion should we need money fast! Being a savvy saver also means we can set ourselves goals and more importantly reach them! For the most part we save usually for the short term. Perhaps for a car, holiday, decorating, new furniture, laptop and so on. However, once you become a savvy saver you could look to more long term saving perhaps for a deposit on a house for example. Yes, you! Realising you are the most important thing in this whole situation is so crucial to becoming a savvy saver! You must pay yourself first. Now we are not suggesting in any way that you skip important bills or don’t pay your mortgage or rent on time, but when you get an income, instantly transfer something towards your savings account, no matter how small. Make the commitment that your savings are paid first. Ideally we should save 10% of all our earned income, but if you are starting out, just put away what you can. Remember it doesn’t matter how small the amount so long as you are saving something. This will build over time and when you see your savings grow it will encourage you to save more! If you are not a regular saver this can be tricky, but in a short time you will get used to putting aside a regular amount each week or month and it becomes a habit to you – yes, there are good habits too! As a guideline you are working towards having 3-6 months of your living expenses available in a savings account in case of emergency. This is of course an ideal and wouldn’t we all love to be in that position? Well, you can, but start where you are at, even if that only means being able to save a few pounds a week. £1 is better than none right? If you struggle with having even a little spare money to save, start to look at ways you could save money on what you spend already. Go through all your regular bills and payments to see where you could reduce the amounts. You will be surprised! Getting cheaper energy bills, mobile phone contracts, TV or movie subscription charges, the list goes on. Look at where your money goes now and consider whether you truly need to make that payment. If you do then look at how you could reduce that payment. Perhaps you subscribe to different TV channels with movies, sports and so on – do you need all those channels? You could save over £20 a month just be reducing the TV channels you watch. Looking at saving on where you spend now means you are freeing up money you could be saving! If you use a tumble dryer why not air your washing or hang it out on dry days. It is surprising how much energy a tumble dryer consumes with regular use. Get yourself a spending tracker app on your phone. You may think you know where your money goes but you will be quite surprised if you track your spending for a month. Do you eat out regularly? Buy lunch or drinks while you are at work? Cut down on things like this and you will save yourself a tidy sum each week just by making your own lunch! At the hear of every savvy saver’s kitchen is a well-stocked pantry! If you are one of those people who is constantly at the supermarket or corner shop you are not being a savvy saver. Think ahead to what meals you are preparing and try to stock up on flavour enhancers to spice up what meals you do have. Keep rice and pasta so you can always have something to whip up in the kitchen. Saving is Good for Your Health! We all know smoking is bad for you. Even those who smoke know that. Each time you light up you are literally burning money. Around £3,000 a year if you smoke 20 a day to be exact! So as well as being harmful to your health it is extremely harmful to your pocket and your potential savings! There is always a reason not to save, so make the commitment to yourself and start today. Share your intention with someone so they can help you in your quest to become a savvy saver and ask you how it’s going. Surround yourself with things that help you become a better saver; read blogs or articles that give tips and advice on how to save. Nottingham Credit Union can help! We offer a number of options to help you become a better saver, get in touch with a member of our team to talk about it. Tags: advice on saving, best advice for savings, how to become a better saver, how to become a savvy saver, savings, savings account, savvy saver, and tips on saving. Love is in the air! Like it or loathe it, Valentine’s Day is upon us. On this single day being romantic can cost you a whopping 50% more in buying roses and 35% more eating out! However, you don’t have to get stung by thorny VAT (Valentine’s Added Tax) this year. 1. Spending the Night in is the New Going Out! M & S and Waitrose are both offering a £20 Valentine’s Day meal deal. Choose from a selection of starters, mains and desserts with a bottle of wine/fizz. Asda, Morrisons and Tesco are also offering meal deals from £10-£15 to make your romantic meal in extra special. Get a £9.00 bottle of champagne from Asda this weekend, add strawberries or raspberries and you have a bubbly breakfast with your loved one. Order a personalised card for just 99p from Getting Personal. They offer a whole range of unusual personalised gifts from around £10 too. If you fancy a special night away, Booking Buddy are offering £29 Nottingham Deals with up to 60% off Nottingham Hotels this weekend. Mark the occasion and make your partner feel extra special and put a Valentine’s Day message in the Nottingham Post! Get a free lineage style ad, photo ad for just £7 or larger ad for £14. Want that traditional romantic meal out? Go Dine have Valentine’s Day menu offers from just £20. Brave the weather, wrap up warm, pack a picnic and some bubbly and take a romantic stroll this Sunday. Follow the self guided trails of Attenborough Nature Reserve, Vicar Water, Clumber Park or Rufford Abbey and if you fancy lunch in the warm instead, Farndon Boathouse is the perfect place for lunch while you are out on your riverside ramble. A wonderful way to show you care is making a love voucher that contains a gift of your time or promise you will do for your partner. It could be a week of foot massages, bubble baths or favourite dinners. Use your imagination but get creative on the voucher, perhaps constructing a large heart from card and sticking the voucher to it. Gift basket filled with your partner’s favourite things. They don’t have to cost the earth but include favourite bubble bath, beer or wine, chocolates, sweets, fruit and so on. Finally we could not get better Valentine’s Day Deals than from our fabulous Money Saving Expert who promises to bag romantic bargains for you. The NHS offers a free 12 week weight loss programme online. Getting started with eating healthier and understanding nutrition can be a daunting task, but this programme makes it easy: http://www.nhs.uk/LiveWell/Loseweight/Pages/Loseweighthome.aspx Take advantage of free resources whenever you can! Before you start making changes to your diet, it is best to talk to your GP. They can assess your health and tell you what types of changes will be safe for you. Spend Sunday evening prepping your meals for the week. You’ll have no excuse to eat out and it will save you wasting food. You can do the same thing with snacks. Instead of buying overpriced 100 calorie packs, you can make your own. Just use a kitchen scale to weigh out a snack sized portion. Buy frozen vegetables. They’re generally cheaper than fresh vegetables and have all the same nutrients. This will also help you reduce food waste. Even if you’re not a vegetarian, have a few meatless days every week. Meat can be pricey and there are other, cheaper protein options out there such as beans. To save money on meat, cook a whole chicken on Sunday and eat the leftovers for the rest of the week. Whole chickens work out to a lot cheaper than buying smaller packs of chicken pieces. It’s easy to re-purpose chicken into many different meals. Cook it in a slow cooker to make things really easy and much healthier than frying it. Buy own brand instead of costlier brands. They usually taste the same at a much lower price. You don’t need a gym membership to exercise. If you have internet access, you can easily find workout videos on Youtube that you can do at home and won’t even require any equipment. You can also go jogging or hiking when the weather permits. To save money on your weekly shop, use comparison shopping website https://www.mysupermarket.co.uk/ to find out where to get the best deals. Take advantage of the reduced section. You’ll usually find the best deals in the reduced section at the end of the day. Just make sure the food won’t go off before you can consume it. When food shopping, compare the price by the weight instead of by the given price. You might find that something with a slightly higher price will actually cost less per g or kg. It often saves to buy in bulk. Get more for your money! Don’t buy pre-made sauces and dressings; they’re usually high in sugar and sodium and will be more costly than making it yourself. All you need for a simple pasta sauce is chopped tomatoes, olive oil and some herbs. A quick Google search will get you plenty of inspiring ideas. You may already have a New Year’s Resolution in mind for 2016. Whether it’s to lose weight, quit smoking, save more money, or spend more time with your family, this may be something you’ve tried and failed to do in the past. Make 2016 the year it actually happens by creating a plan and sticking to it. A SMART goal is specific, measureable, attainable, relevant and timely. If your resolution is to lose weight, then exactly how much weight do you want to lose? Can you realistically lose that much in a year? Can you break that down into a monthly weight loss goal? Setting a SMART goal will help you avoid setting yourself up for disappointment or getting off track. Bring out your competitive side and challenge a friend to keep both of you motivated. Set a prize for the winner at the end of the year and check up on each other’s progress regularly. If you can get a whole group together that’s even better. Get 10 of your friends/family/coworkers together and each chip in £20 toward the prize and the winner gets £200! The thought of losing money is definitely a big motivator for most of us! When times get tough, think about the end goal. You might be saving up for a beach holiday, or for your child’s future. You might be trying to lose weight for your wedding or to get to a healthy BMI. Whatever the cause may be, think about how it’s going to feel when you reach your goal. You might be suffering right now, but pain is temporary. Your muscles might be aching or you might be missing those fancy lattes, but in the end it will be worth it. Give yourself a little reward for each milestone that you reach. Don’t compromise your goal of course, but treating yourself once in a while will keep you motivated. When you reach your end of year goal, you can go all out and celebrate! Tags: goal setting, new years, new years resolution, and smart goals. It’s easy to let Christmas spending get out of hand. Don’t get carried away; instead read our tips on how to spend less at Christmas and still enjoy yourself without feeling like you’re scrimping. Check prices online before you hit the stores. Do some comparison shopping so you know where to go for the best deal. Certain things may also be cheaper online, so if there’s free shipping available you won’t even need to venture into town. Look for discount codes and vouchers online. Try a quick Google search or check the Facebook and Twitter pages of the stores you’re planning on shopping at as they may have posted deals there. Have a plan – know how much you’re going to spend and who is getting what. If you set a budget for all of your presents and have a list, you’ll be less likely to overspend. Take advantage of Black Friday and Cyber Monday offers. This is no longer an exclusively American event. UK retailers have embraced Black Friday, so there are plenty of savings to be had. If you’re brave enough to endure the crowds, you could score some great deals on things like clothing and electronics. But fear not, you don’t have to leave the comfort of your own home to take advantage. Here’s a list of the major Black Friday sales this year. Have you signed up for rewards cards such as the Tesco Clubcard and Boots card like we recommended in our blog post about saving money? Now is the time to spend all of the points you’ve accumulated. You might be surprised to find out how many points you’ve earned! Avoid signing up for store credit cards as they usually have very high interest rates. They will try to lure you in with free gifts and discounts, but resist the temptation! The risks are not worth the reward. Instead of buying presents for each and every one of your friends and coworkers, set up a Secret Santa. You’ll save a lot of money only having to buy one present, and the element of mystery makes it a lot more fun. Even if you’re not the best at crafts, you can still make Christmas gifts and decorations to save money. Instead of buying an expensive hamper, put one together yourself. Get the kids involved and make baubles and stockings. Check Pinterest for inspiration. After all, Christmas should be about spending time with each other, not having the most expensive gifts and decorations. January is the time to stock up on stuff for next year. Get things like wrapping paper and decorations on clearance and even find presents to save for next year or upcoming birthdays. You’ll thank yourself next Christmas for being prepared. Tags: black friday, christmas, saving money, and spend less. With the holidays approaching and Christmas shopping underway, you might be feeling strapped for cash. Luckily, there are easy ways to make extra money quickly. These are by no means “get rich quick” schemes, but they are something you can do alongside your regular job. If you would enjoy sharing your opinions about a product with a group of strangers, then focus groups are perfect for you. They are usually in person, although some are now online, and last anywhere from half an hour to a few hours. They generally pay pretty well and you can even make up to £200 depending on the length and what’s involved. Don’t count on this as a regular source of income though as researchers are always looking for a specific subset of people for a focus group and often you will not qualify. Taste tests are pretty similar to focus groups, but are often a lot shorter in length. They may be only 10 or 20 minutes, so they also pay less than focus groups. But if you’re short on time, these can be great to do while you’re out and about. They’re also easier to qualify for than focus groups, so you can do more of them. However, be aware that you may have to try some not-so-great tasting food! Some of the above focus group companies will advertise for taste tests as well. University researchers are always looking for participants for psychological studies. With two major universities in Nottingham, you are sure to be able to find some studies to participate in. They won’t pay a ton of money, probably about £8-£10 per hour, but are very easy to complete. Medical schools also look for people to act as “patients” for their exams. All you have to do is pretend to be a patient with whichever medical condition they assign you. Look for these roles near to exam time. Got a funny or embarrassing story? Magazines such as Love it! and Woman’s Own will pay you for your stories, tips or photos. You can get anywhere from £20 to £100, but make sure you’re comfortable with the world reading your story before you submit! Many retailers and restaurants take on extra staff during the holidays, so there are many temp jobs available for a few weeks or months. This is a great option for students who would otherwise be sitting around at home over Christmas holidays. Whether you’re looking for full-time or part-time, there are many options available. They often start recruiting very early for these roles, so start looking around September or October. It’s a bit late in the year now, but it is still worth looking! Expect to make minimum wage. If you’re in a bind and need cash quickly, or just want to clear out some clutter, you might be considering selling some of your stuff. Your best options will most likely be eBay and Facebook groups. For larger items like furniture or boxes full of children’s clothing and toys, look on Facebook for local selling groups. For adult’s clothes and smaller and more valuable items, try eBay. Don’t expect to make a huge profit unless you’ve got antiques or something truly valuable. But for a small amount of effort, it’s worth getting some cash back for your stuff rather than just throwing it out. Tags: jobs and make extra money. Myth: If you have bad credit your only options are payday and doorstep lenders. While you may have trouble getting a loan from a high street bank, payday and doorstep lenders are not the place to turn to. They often have interest rates through the roof, and you will ultimately end up in a worse financial position. Luckily, credit unions offer loans for people with bad credit or no credit at fair rates. 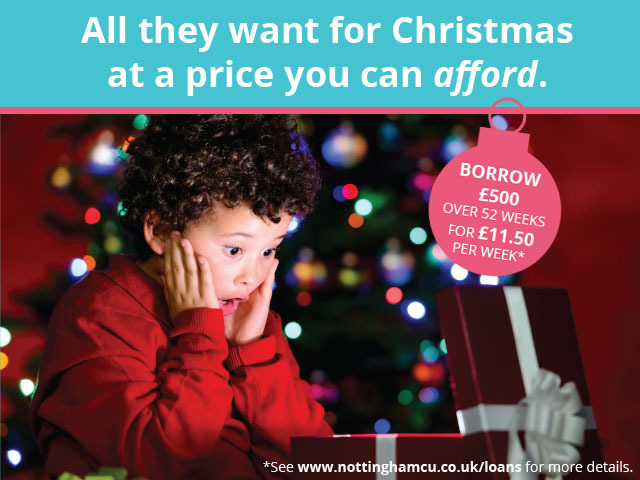 Click here to learn more about applying for a loan from Nottingham Credit Union. Myth: Applying for a loan is complicated and time consuming. Applying for a loan is really not as scary as it sounds. To apply for a loan at NCU, all you have to do is fill in a short application form answering some questions about your finances so we can determine how we can help you. Decisions are made quickly and on a case by case basis so your individual needs are taken into account. Your credit rating will be damaged by a rejection. A rejection shouldn’t do much damage unless you have made multiple applications with different companies. To protect your credit rating, your best bet is to only make one application. Myth: Taking out a loan will just make my debt situation even worse. If you have multiple debts with different interest rates, it might benefit you to consolidate them by taking out a loan to pay them off that has a lower interest rate. It is also a lot easier to manage one payment plan rather than several different ones. If you make your monthly payments and pay off the loan on time, it will end up improving your credit score. Myth: There is an advantage in applying for more than you need. You might believe that asking for more than you need will allow you to pay off the first payment of your loan, or even increase your chance of getting approved. However, lenders will only give out loans that it believes a borrower can repay, and you may end up in more trouble if you end up with repayment terms that are beyond your means. Tags: loans, misconceptions about loans, myths, and myths about loans. Many people could benefit from joining a credit union, but their misconceptions could be preventing them from joining. We are going to debunk some of these credit union myths and hopefully reduce the confusion about credit unions. Credit unions have strict eligibility requirements. While there are eligibility requirements for joining a credit union, they are not as strict as you might think. To join Nottingham Credit Union, you only have to live or work in Nottinghamshire. Other types of credit unions may require you to be a member of a union, a church or have attended a certain university. It is very likely you are eligible to join at least one credit union. You can check which ones you can join here. You may even be eligible to join our Payroll Pro scheme if you work for one of our payroll partners. This entitles you to exclusive rates and offers. Find out if you are eligible here. Your money isn’t protected by insurance. When you make a deposit into your Nottingham Credit Union savings account, your money is protected by the Financial Services Compensation Scheme (FSCS). Individual depositors are entitled to a claim of up to £85,000 and joint accounts up to £170,000. On the off chance that NCU or any other credit union in the UK was unable to meet its financial obligations; your money would be fully protected. Your money is just as safe in a credit union as it is in a bank. They are unlikely to be around in ten years’ time. Credit unions have existed in the UK since the 1960s and NCU was founded in 1992. It is unlikely that credit unions will disappear; in fact, they are growing in membership every year. Credit unions do not offer rewards programmes. This varies by credit union, but many do offer cashback rewards and incentives. NCU is now offering the Engage card, which is a prepaid debit card that can earn you up to 15% cashback at various retailers. You can find out more here. The technology credit unions use is outdated. Credit unions may not have as big of a budget as the banks, but their technology is still up to date. Online banking is easy with NCU and most other credit unions. There are fewer places to withdraw your money. You can easily withdraw money from your NCU savings account by BACs transfer either online or by phone. The Engage card can be used at any ATM and anywhere Visa is accepted. Most credit unions offer access to a large network of ATMs, so accessing your money is not a problem. Credit unions are only for people who are low income or have bad credit. Credit unions can be beneficial for people of all financial backgrounds. There are many benefits to choosing a credit union over a bank; we are able to avoid added on fees such as those for early repayment, so you may find that a loan with us would be more affordable. By saving your money with a credit union, you are also helping the local community by allowing someone else to borrow. They are a good place to keep your savings, but not for much else. Credit unions offer a variety of products such as loans with competitive interest rates and everyday banking. You may find that switching to a credit union is better for all of your banking needs as there are generally less fees. Credit unions are an old, outdated concept. In contrast, credit unions are quite a progressive concept. With shopping local becoming more and more popular, it only makes sense to bank locally as well. Making large corporations wealthier is really the outdated concept. Opening an account is a difficult and lengthy process. It is very easy to open an account at NCU. All you have to do is fill in an application form here. Just have your ID and bank details ready and you’re all set. Tags: credit union, credit union myths, misconceptions, and myths. Set money aside without having to think about it. Make regular contributions to your Nottingham Credit Union savings account by standing order or from your salary (if you work for one of our employer partners). Before you know it, you’ll have saved up a fair amount of money without ever realising it had gone. Switch energy providers. You can find the cheapest deal with Money Saving Expert’s Cheap Energy Club. Unplug appliances when they’re not being used. Use comparison shopping sites like http://www.mysupermarket.co.uk/ to find the best deals for your weekly food shop. You can compare individual items across stores to see which one has the lowest price at any given time. Take advantage of supermarket loyalty cards like the Tesco Clubcard and Sainsbury’s Nectar Card that allow you to earn points and vouchers. Buy food in bulk and store it in the freezer to get lower prices and avoid waste. You can find a list of freezable foods here. Use a slow cooker to prepare meals for the week instead of eating out. It’s cheaper than using the oven and you can leave it on while you’re at work to come home to a freshly cooked hot meal. All of those meals out with your friends can start adding up. Instead of going to a restaurant, take turns cooking for each other or have a potluck. It costs a lot less and can end up being more fun! You can also save a lot just by taking your own lunch to work instead of eating out. Just set aside a few minutes the night before or in the morning before work. Invest in a reusable water bottle rather than buying bottled water. Buy store brand instead of name brand. Often times you can’t taste the difference and it can end up saving you a lot in the long run. Make your own beer and wine. You can buy a kit at Wilko’s for as little as £10 for 40 pints. Not only is it 25p per pint, but it’s also fun to make as well. You can also grow your own herbs as opposed to buying them as you need them. A basil plant from Sainsbury’s costs £1.50 and keeps growing back, whereas a bunch of fresh basil costs 80p and will go off in a few days. Take advantage of reward cards like our prepaid card that offers cashback at many national and local retailers. Check to see if your children are entitled to any benefits such as free meals or school uniform. Do your holiday shopping right after the holidays when everything goes on sale. You may not want to think about Christmas in January, but it will save you money later in the year. Buy presents in advance during seasonal sales. The recipient will never know you got a discount on it and you won’t have to worry about finding a gift at the last minute. Exercise at home instead of paying for a gym membership. There are plenty of workout videos you can watch for free on Youtube on channels such as PopSugar Fitness and GymRa. Youtube is great for learning how to do all sorts of things. You can save money by doing things yourself instead of paying someone, such as cutting your own hair. If that sounds a bit intimidating, you can always go to a beauty school to get your hair done at a discount or even for free. Sell old mobiles and electronics for cash by finding the best deal on http://mobilevaluer.com/. Sell things you no longer need on Ebay and get good deals from other sellers on things such as clothing and home goods. Take advantage of free trials such as Amazon Prime and Netflix, but don’t forget to cancel them before the trial period is over! Quit smoking. You no doubt know the health impacts of smoking but it could be burning a hole in your wallet too. Avoid payday loans – come to us instead for competitive interest rates regardless of your credit history. Tags: advice, blog, how to start saving money, and savings.